This black 100% silk shell has a black 100% polyester lining and was made in India by Valerie Stevens Evening. 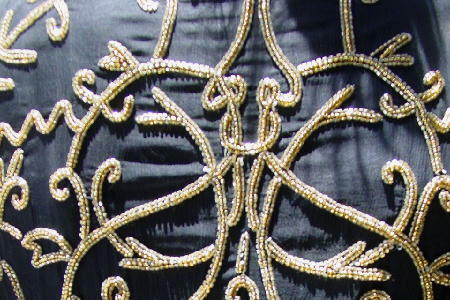 The sheer black silk has a surface of thin lines. The neckline, sleeve ends, front side, and bottom hem as well as the design pattern are in light and dark gold tiny beads. It has a jewel neckline, shoulder pads, long sleeves, and a hidden hook closure at the top sides. It has a few beads missing. The jacket has quite a bit of weight to it. shoulder to hem 19 1/4"